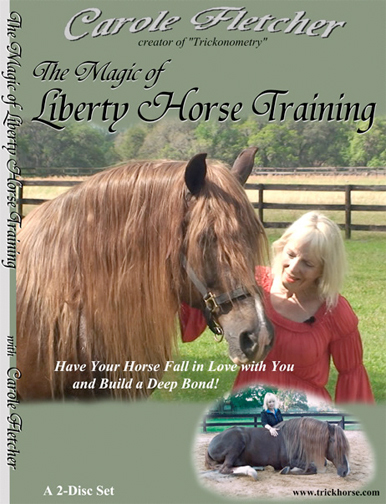 THE MAGIC OF LIBERTY HORSE TRAINING DVD's!!! It's Amazing! It's Inspirational! Create that Special Bond with Your Horse! Bring tears to people's eyes with your horse relationship! 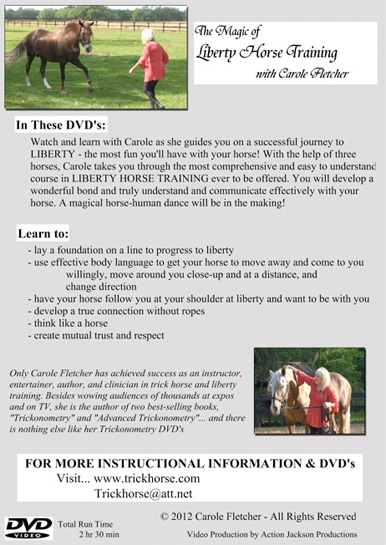 Connect with your horse through Carole's tried and true on line exercises that establish a foundation for Liberty Training. Without any restraints or attachments to your horse--no need for tack-- learn how through body language, voice commands and whip cues, to send your horse away from you and have him come to you, and follow you by staying at your shoulder, first in small and then larger arenas, and eventually even in a pasture. In a clear, easy-to-follow sequence, you will learn how to create a horse-human dance by having the horse trot circles around you, change direction and even perform tricks--all at liberty. This is the bond you've been looking for. Your horse will fall in love with you and want to be with you, come to you whenever he sees or hears you, and calls for you. What an honor it is to have a loving mutually respectful relationship with a horse. Carole uses three horses, two of them stallions, in these DVD's that have a running time of 2 and 1/2 hours. Yes, that deep bond with your horse IS possible! Carole Fletcher will show you how. NOTE: DVD's are NOT returnable unless damaged prior to viewing.